18th-century(?) red morocco blind and gold tooled, one clasp, in 1963 box by JPW labeled: Heures of B.M.V. 1480. 244 leaves (1 column, 13 lines), bound : vellum, ill. ; 55 x 44 mm. Inscription on front pastedown: iste liber est meus post mortem Nerio? Nescio? Cujus Cru...; Wilhelmus Antonius Versen 1764 (inscription on fol. 1); purchased by Julia Parker Wightman in 1963; JPW 4902; Julia Parker Wightman Bequest in 1994. 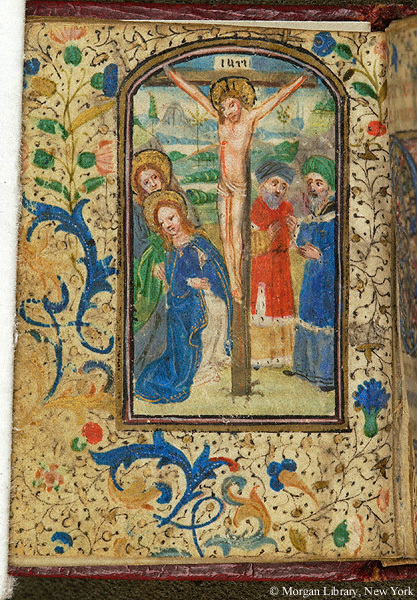 Ms. book of hours, calendar for Bruges; written and illuminated in Bruges, Belgium, ca. 1460-1470. Decoration: 11 full-page inserted miniatures with full borders, 13 illuminated initials with full borders, a line drawing in brown ink (fol. 239) depicting a full-length frontal figure holding a palm leaf(?) and a cross(?). Artist: workshop of William Vrelant. An accompanying note in the manuscript reads: "For Morgan's choice '92 John Plummer".